Kuusisto took up the post of chief conductor of the Kuopio Symphony Orchestra in 2018, and returned to the Finnish National Opera in 2019 to conduct the world première of his new opera Jää (Ice). 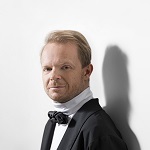 He is a regular guest conductor with orchestras such as the Finnish Radio Symphony Orchestra, Helsinki Philharmonic Orchestra and Lahti Symphony Orchestra, and has previously served as principal guest conductor of the Oulu Symphony Orchestra. Currently he is artistic director of the Oulu Music Festival. For more information, please visit Jaakko Kuusisto's website.